Folk-Celtic-Rock at its finest! Angry McFinn and the Old Yank join the podcast to talk about style, weddings, and Hip-Hop Country. Max von Schuler-Kobayashi joins the podcast to discuss weird Korean activism, artificial intelligence fails, and creepy liberal gaijins. Question authority. Kill Your TV. The revolution will be podcasted. The episode begins with a rant at the adults who make life boring, the curse of paper, soft people, and how to make a better future for mankind. The second half features a live recording of LifeGarden, an acoustic jewel by any standard. This recording is from the "Live From Koenji" Acoustic Special put on by Charlie's Place, Off Beat Photography, and this podcast. 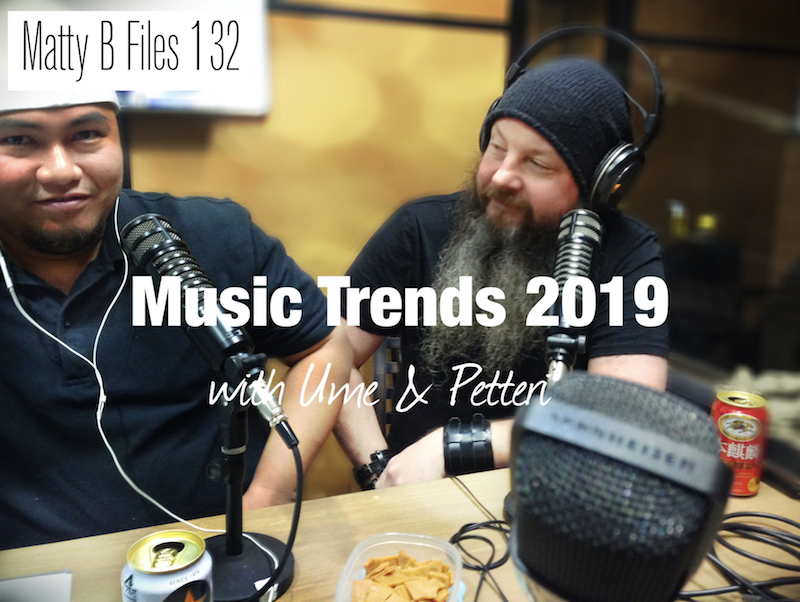 Petter and Ume join the podcast to discuss Music Trends for 2019. Blockchain, AI, music scene, hype... where is this all going? Tune and Find OUT! Author Max von Schuler-Kobayashi and Matt Bigelow discuss military scandals and surveillance technology on the Asian front. Takashi Umemiya and the Comrades is a Roots Rock Reggae group. Their new album is being released Feb. 3, 2019. Petteri and I begin the podcast by talking about podcasts, phones, conspiracy theories, then Ume arrives to talk about recording music, writing songs, and pariahs in the music scene. RedBedRock is a multicultural rock band based in Tokyo, Japan. Their sounds combine influences such as Hard Rock, world music, and Latin, inspiring them to develop their own unique sound. Charlie the Australian mushroom farmer of "Charlie's Place" fame, his brother George AND Andrew Holtby from Off Beat Photography join the podcast. We talk about travel in Japan, mushroom farming, and the father's that give, and take away, and then give back -- our dreams. Author Max von Schuler Kobayashi joins the podcast to discuss the top trends and news in Japan for November/December 2018. Cliff and Buddha, hosts of the Raw Urban Mobile Podcast (RUMP), let me into their mobile studio (van) in Shibuya (chick-town). We talk about words, Urban Culture in Japan, and where we don’t wanna die. In the intro (18mins long) I respond to one of my accusers. And talk about festivals. I review the top indie acts from around the world who have appeared as guests on my podcast from the first half of 2017. Featuring acts from Romania, the Philippines, Italy, Hawaii, California, Boston, etc. It's a MemoryHole PlayList like no other! BONUS 2 - Mike Rogers -- Sound Track "Ghost Roads a Rock and Roll Ghost Story" "Walk on the Ghost Road" by "Mr. Pan and the Screamin' Telsters"
for this month's JAPAN, MONTH IN REVIEW, OCTOBER 2018! Friends, plenty of musicians have graced the podcast with their presence. I review a handcrafted selection of tunes from around the world and revisit my history with the music and the people. A lot of greats, some neutrals, and a few gone sour. Strap in for a mixtape and let your ears ride on the sonic highways peppered with insider gossip. 122 | JamCast 14 "Cage Wrattlin'"
A JamCast is when Nikolas Faraguna and I mic up a drum kit, a guitar, hit the record button, and record music. We upload the musical conversation, warts and all. Reach out to us and tell us what you think. Like, share, comment, and subscribe! Falling Doves are back in Tokyo on their Japan Tour. Falling Doves is a rock band from Hollywood that sounds like a Gutter Whiskey Slide built by Border-Line Degenerates on a Tuesday Afternoon After Waking up Hungover 5-Years in-a-Row. It’s great driving music. Bamboo Star from Hong Kong joins the podcast to talk about the Hong Kong Music Scene, Touring Japan, and the Social Credit System. Fuad, frontman for the band Kyoto Protocol from Malaysia, is in Tokyo on tour. We talk about the music scene in Malaysia, Malaysian politics, and the pros and cons of the current state of music. You can also hear Kyoto Protocol’s new single “Delta Wing”, available on digital platforms worldwide. 118 | JamCast 13 "Lickin' 'em 'n Pickin' 'em"
On this episode of the Matty B Files Podcast, Nikoas on Guitar and Matt on Drums mic up a studio, hit the record button, and invent live music. Balls out, no regrets. Full on groove. Solos and melodies that will only ever be played once. It's all adlibbed, bruv. Strap in music lovers, and blast off into the JamCast. Thank you for listening in. In this episode we delve into the internal struggles of Jim from the perspective of a dystopian parralel dimension.